Join us for the next GFW PRSA luncheon, Wednesday, May 8, featuring guest speaker, Kim Speairs, APR, MBA, PCCA Director of Communications and Engagement. Culture can be a major competitive advantage in a tight economy and even tighter job market. A company’s culture drives people’s behavior, engagement, innovation, customer service and its overall profitability. And yet, many companies are not dedicating the time or resources to define and foster it. In this workshop, we’ll explore how and why you – as a public relations and communications professional – can develop and help drive team engagement throughout your organization. We’ll look at how and where to initiate the conversations, how to gather the insights you need and ways to put a plan into action. 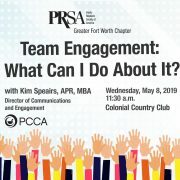 When: Wednesday, May 8, 2019, 11:30 A.M. – 1:00 P.M.
https://fortworthprsa.org/wp-content/uploads/2019/04/0-1.jpg 1081 1921 Maddie Thannum http://fortworthprsa.dividesignpros.com/wp-content/uploads/2019/01/GFWPRSALogo2018-300x287.jpg Maddie Thannum2019-04-24 14:52:562019-04-24 14:52:56Join us for our next GFW PRSA luncheon on Wednesday, May 8, at Colonial Country Club! Nobody really wants to look at your travel pictures. And this was particularly true on April 12, 1961, when Soviet cosmonaut Yuri Gagarin successfully completed the first orbit of Earth. 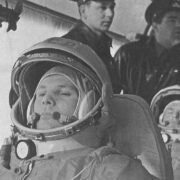 Gagarin’s flight thrilled the Communists – but terrified just about everyone else. The U.S. was already fretting about the space race, as the Soviets had successfully launched the first satellite. Gagarin’s orbit was even more humiliating, especially since his flight took off on time. Some publications had a more political angle. The Daily Worker, a pro-Communist U.S. paper, announced, “A Communist in Space,” while a paper with a slightly different perspective declared, “REDS ORBIT MAN.” The Christian Science Monitor struck a metaphysical tone, observing, “Man Leaps Free of Earth Shackles,” while Time magazine’s cover illustration of Gagarin included a Soviet hammer and sickle – in flight. On television, ABC News intoned that “all of Russia was going wild,” and then discussed in detail how the Soviets were already planning a flight to the moon, where their female athletes could train in total secrecy. In D.C, President Kennedy was desperate to find people who could help the U.S. catch up. “Let’s find somebody, anybody,” he said.” I don’t care if it’s the janitor over there, if he knows how.” The next month, Kennedy announced that the U.S. should set a goal to get a man to the moon before the end of the decade. In making the announcement, JFK abandoned his original campaign promise to eliminate potholes in America, a goal that continues to elude our brightest minds. Fortunately, the U.S. marshaled its resources and responded brilliantly: In the years to come, we would complete many important space projects, including Star Trek, Apollo 13, All the Right Stuff and creating an entire planet of Ewoks. It makes you proud to be an American. And proud to be a PR pro, as well. Because when it’s time to celebrate a client’s achievements, we know how to build ‘em, launch ’em and land ’em. And of course, the view is spectacular. Over the past two decades, companies like Microsoft, State Farm, and Johnson & Johnson have used an understanding of customer jobs to create breakthrough innovations. A focus on the customer job has helped them to see beyond how things are done today to understand the value that customers seek. In this talk, Lance Bettencourt, professor of marketing at TCU and one of the leading experts on jobs-to-be-done thinking, will demonstrate the power of a jobs-to-be-done lens for shaping thinking about how public relations can and should offer value. Drawing from real examples, he will challenge the audience to see the value of PR not in what it does, but in the impact it should have. 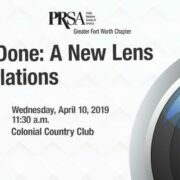 When: Wednesday, April 10, 2019, 11:30 A.M. – 1:00 P.M.
https://fortworthprsa.org/wp-content/uploads/2019/03/0.jpg 321 845 Maddie Thannum http://fortworthprsa.dividesignpros.com/wp-content/uploads/2019/01/GFWPRSALogo2018-300x287.jpg Maddie Thannum2019-03-18 11:33:042019-03-18 12:25:21Join us for our next GFW PRSA luncheon on Wednesday, April 10, at Colonial Country Club! The couple had secretly married on March 20. Knowing that the marriage announcement would attract widespread media attention, the couple decided to, in today’s parlance, re-purpose their content. So they checked in to the Presidential Suite of the Amsterdam Hilton Hotel and invited the press to visit them in their room. But instead of finding the couple in sexual congress, they found them in opposition to Congress. The newlyweds were wearing their PJs and snuggled in bed, calling for an end to the Vietnam War and violence around the world. 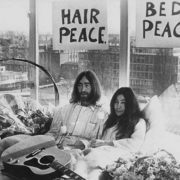 With reporters crowding around them, Yoko explained, “We’re thinking that, instead of going out and fight and make war or something like that, we should just stay in bed: Everybody should just stay in bed and enjoy the spring.” Politics really does make for strange bedfellows. From March 25-31, Lennon and Ono received the media and visitors daily, answering questions, occasionally calling out “All you need is love,” and continually adjusting their respective Sleep Number settings. The protest did receive extensive coverage, but the media reaction was lukewarm. One paper declared, “Beatle Lennon and his charmer Yoko have now established themselves as the outstanding nutcases of the world.” And one reporter, apparently missing the irony of the moment, asked Lennon, “Is there not a more positive way of demonstrating in favor of peace than sitting in bed?” To which Lennon replied, “Stop asking us if you think it’s going to work and do something yourself.” Ol’ John probably would have been a pretty good PR consultant – too bad he missed his calling. Sometimes forgotten is that, a couple of months later, the couple held a second bed-in, in a Montreal hotel room. It’s where they recorded, “Give Peace a Chance,” joined by several celebrities and, I believe, the Fiji Water Girl. Lennon, with McCartney, later wrote a song about the experience, “The Ballad of John and Yoko.” It references the media three times, and concludes, “The way things are going, they’re going to crucify me.” The Beatles split up the next year, and in 1980, Lennon was shot and killed. Of course, the bed-in did not succeed in ending the war. But it did help the Amsterdam Hilton: The room, now known as the John and Yoko Suite, is available for around $2,000 a night. And there is little doubt that, as a PR strategy, the bed-ins were both imaginative and effective. All of which should help us remember: A little careless pillow talk can destroy a great PR campaign. And sometimes, launch one. A government shutdown is no laughing matter. But government work can be pretty funny, and that was the case in February 1964, when the FBI launched a major investigation into … a song. 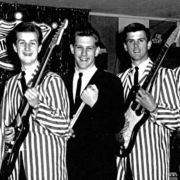 “Louie Louie” was a demo record cut by in one take by the Kingsmen, a second-tier band. The production was so shoddy it rendered the lyrics unintelligible, so much so that when the song was released in May 1963, one DJ declared it the worst single of the week. Despite – or rather, because of — its faults, Louie Louie eventually reached No. 2 on the charts. Quite possibly, the song would have faded into obscurity after that. But it was rescued by a highly effective marketing tactic that has withstood the test of time: Someone took offense. Then, after 30 months and more than 100 pages of documentation, the FBI closed the investigation, concluding that the song was “unintelligible at any speed,” which would make for a great name for a band. Not incidentally, the incomprehensible effect was unintentional. But while the actual lyrics are not the least bit offensive, there IS in fact an obscenity in the song, which can be clearly heard. Hey, don’t feel bad if you missed it – the FBI did, too. Today, there are more than 1,500 versions of Louie Louie. It’s been included in more than 30 movies, has generated a book and a documentary, and April 11 is International Louie Louie Day. (Shouldn’t that be a federal holiday?) Rolling Stone identified Louie Louie as the fourth most-influential recording of all time; it’s also one of the greatest unintentional PR coups of all time. Which should help remind us that, while PR pros work very hard to give our clients the best possible exposure, sometimes, our most effective tactic might be to just let others do the work for us. No offense, mind you.